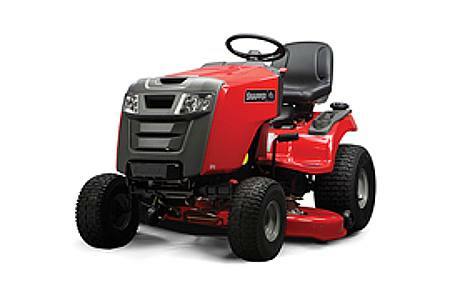 Step up to a Snapper® SPX™ Series ride on mower with high-value features at an affordable price point. Easily maneuver around landscaping with a tight 14-inch turning radius and quick adjust grass cutting height that lets you adapt to your lawn's needs. Powered by a Briggs & Stratton Intek-V-Twin or a Professional Series™ Engine, this lawn tractor features OHV (Overhead Valve) technology with a simple-to-maintain design for a more durable engine. Ideal for medium to large yards, its hydrostatic transmission lets you choose the pace. Step Up to High Value: All steel construction including the hood, cast-iron front axle and a hydrostatic transmission are hallmarks of a premium Snapper riding mower - all at a value price. Dump Cart: The 10-cu ft. multi-functional cart takes the heavy-lifting out of yard work. Soft Sided Snow Cab: Keep the howling, cold wind out with our vinyl snow cab riding mower attachment, complete with clear, shatterproof, non-fogging Lexan® windows. 36" Tiller Attachment: Three-foot wide tilling swath prepares soil quickly for planting. The 36" tiller riding mower attachment comes with heavy-duty steel tines. 40" Tow-Behind Dethatcher: Easily remove thatch from the lawn by using the Snapper tractor dethatcher attachment. Grass Mulching Kit: Reduce your number of grass clippings by finely mulching them back into the lawn. Additional shredder blades are available to crush Fall leaves. Tractor Cover: Great for storing your riding mower, tractor covers protect and keep your Snapper mower clean until next season. All power levels are stated gross horsepower at 3600 rpm per SAE J1940 as rated by Briggs & Stratton. Front: 15x6 in. ; Rear: 20x10 in.